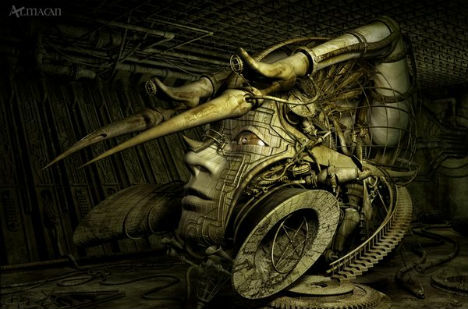 Amid the sea of digital art displayed online, many artists get lost, but there’s simply no way to overlook the bizarre robotic creatures and complex machinery of Kazuhiko Nakamura. 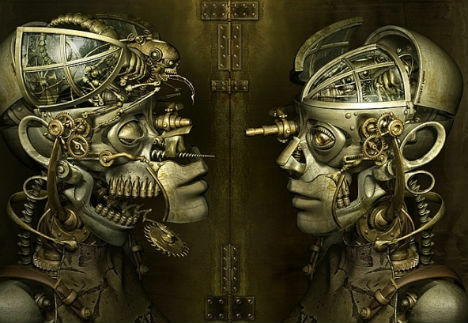 Eschewing the photorealism trend, this Japanese artist draws an incredible cornucopia of futuristic cyberpunk imagery from his mind and puts it together like a puzzle, one piece at a time. Nakamura says that each work continues to transform and reveal itself to him as he works in an unpredictable metamorphosis that results in “restructured fragmentary images [that] are reborn as the mechanical mirage” in a desert of pixels. Though what we as viewers see is the final result, the assembled Frankenstein’s machine of Nakamura’s imagination, some images give us a peek at the many hidden components that make up the whole. 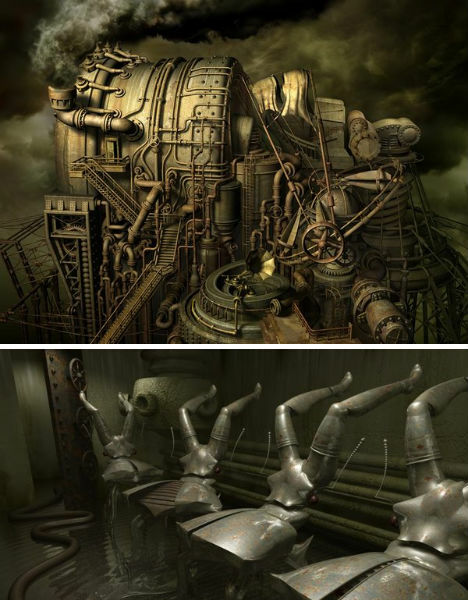 In ‘Automaton’ (top image), Nakamura gives us two views of the same robotic creature, a torture machine disguised as an antique mannequin. 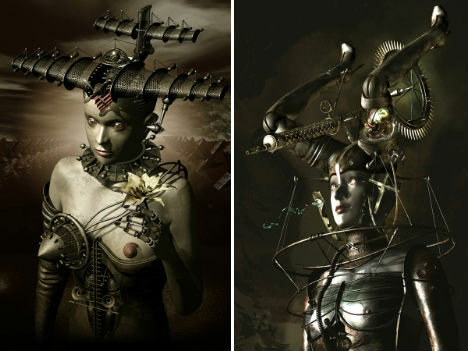 The one on the left reveals the frightening drills, saws, bullet teeth and an insect-like brain that lay behind a facade that opens up like a gruesome mechanical flower.